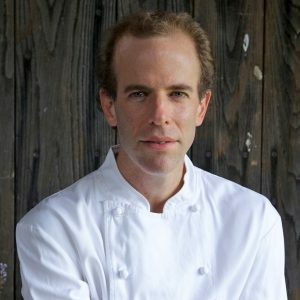 Dan Barber is the chef and co-owner of Blue Hill and Blue Hill at Stone Barns, and the author of The Third Plate (2014). He opened Blue Hill restaurant with family members David and Laureen Barber in May of 2000 and two years later he was named one of the country’s “Best New Chefs” by Food and Wine magazine. Since then, he has been addressing local food issues through op-eds in The New York Times and articles in Gourmet, Saveur, and Food and Wine. Dan has been featured on CBS Sunday Morning and in The New Yorker, House and Garden, and Martha Stewart Living. His writing has been incorporated into the annual Best Food Writing anthology for the past five years. In the spring of 2004 both his second restaurant, Blue Hill at Stone Barns, and Stone Barns Center for Food and Agriculture opened their doors in Pocantico Hills, New York. As the restaurant’s executive chef/co-owner and a board member of the Stone Barns Center, Dan brings the principles of good farming directly to the table and seeks to turn the dining experience into an educational one as well. His efforts to raise consciousness about the effects of everyday food choices have led him to participate in projects with Harvard Medical School’s Center for Health and the Global Environment, the Kellogg Foundation, and New York City’s greenmarkets. Barber has received multiple James Beard awards including Best Chef: New York City (2006) and the country’s Outstanding Chef (2009). In 2009 he was named one of Time magazine’s 100 most influential people in the world.